TJ Morris, the Home Bargains retailer, has gone live with its £110m, 1,000,000 sq ft distribution centre at Amesbury, Wiltshire. 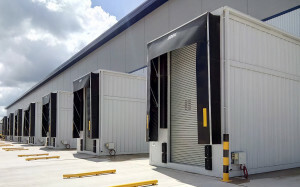 The site uses 15 double deck lifts, and ancillary equipment supplied by Transdek. Gary Cobb, distribution operations manager for TJ Morris, said: “We have already converted our goods out operation with Transdek’s double deck loading systems at our RDC in Liverpool. Based on its all-round professional service and the reliability of its lifts, Transdek was the chosen partner for our new Southern RDC. Transdek has installed 12 20-tonne (18 pallet/30 roll cage capacity) and three 6.5-tonne (6 pallet/12 roll cage capacity) double deck lifts at the RDC, along with a vehicle cleansing lift, which is used for jet washing and cleaning inside vehicles. The 900mm docks allow a double deck trailer to be loaded in two lift cycles – significantly reducing vehicle fill times, which speeds up turnaround, minimises product handling, improves safety and drives down costs. Transdek also manufactured 15 modular loading ramps to facilitate a descending gradient from the warehouse for the direct run on and run off the lower vehicle deck. Liverpool based TJ Morris operates more than 400 Home Bargains stores across the UK and employs over 13,500 staff. With a turnover of £1.5bn and growth of over 15 per cent per annum, the company is the second largest independent grocer in the UK and plans to expand to more than 700 stores within the next five years. Each modular double deck lift was supplied as a pre-built pod, designed for rapid installation directly onto the yard slab. All lifts were initially held off site at Transdek’s Yorkshire-based factory and delivered to Amesbury as required to meet the build schedule of main contractor McLaren. A two-day window was allowed for the fitment of each unit.